This lesson gets you familiar with the Visual Designer, the web application you need to build models and diagrams with. You will become familiar with the structure of a project and learn how to navigate between basic project components, using them correctly. You can also draw static use case diagram online or draw other visualizations using templates. But see other tutorials for that. First you need an existing folder structure or create a new folder structure. In that folder structure we are going to put data (entities). We are going to relate the entities into a model. Than we create a view (a filter) on top of that model and finally we are going to connect the view together with a visualization canvas, creating a diagram. What is a UML Use Case Diagram? 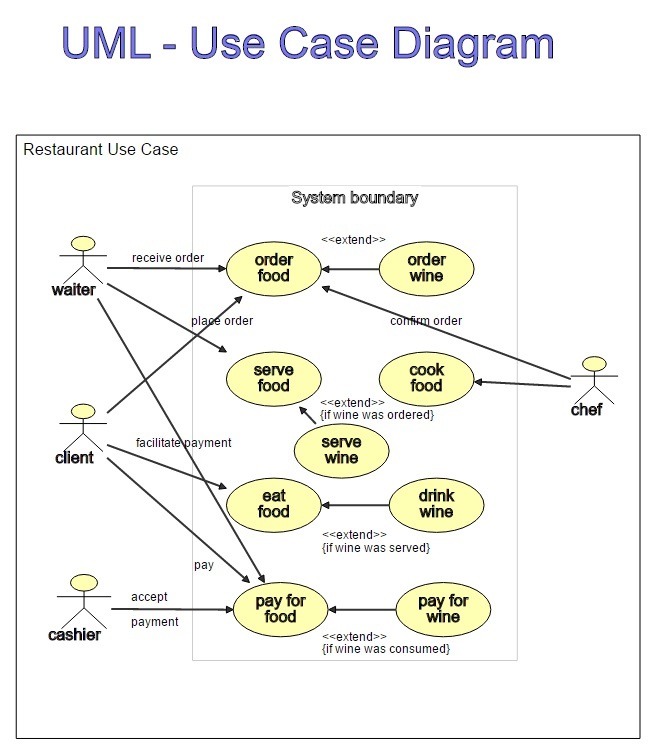 The UML modeling language defines a use case diagram. That is a graphical schema showing a formal actors-systems-functions-model. A use case model consists of actors, a system and the functions or activities of a system, called use cases and the environment the system belongs to. A use case is used in systems analysis to identify, clarify and organize systems requirements. By creating a use case diagram you build a representation of sequences of interaction between users and a system, or its functions. You show the relationships and the different use cases in which the user is involved in a particular environment and related to a particular goal. Expand a Dossier in the Explorer Treeview by clicking on the plus sign if it already has folders in it. If not, select New Dossier by clicking on its name. Click on Insert Folder and type in the name of the folder in the name field of the New/Edit Dialog, inserting the following top level folders: Data, Model, Relationships, View, Visualization. This is the first step out of four steps: Data, Model, View, Visualization, for every dynamic diagram to take. We will enter data that later on will be connected to the model. Insert three actors like this (for example: waiter, client, cashier). You may also choose the entities of stakeholders or person if you like, instead of actor. This is the second step out of four steps: Data, Model, View, Visualization, for all dynamic use cases to take. We will draw a model where every entity will be connected to a data item. When the name of the data item changes, the visualization, in the end, will show that change automatically. You can create a model in three ways: by dragging shapes from the panel, by dragging data from the explorer or by inserting shapes from the drop down menu. In this tutorial, we drag shapes from the shapes panel. Select the connections and give them names in the Inspector Connection Panel. Select a connection by doing a mouseover, over the connection, and then click on the black wheel icon. Now the connection properties are selected in the connection panel in the Inspector at the right. You have now a model that is linked to the entered data. 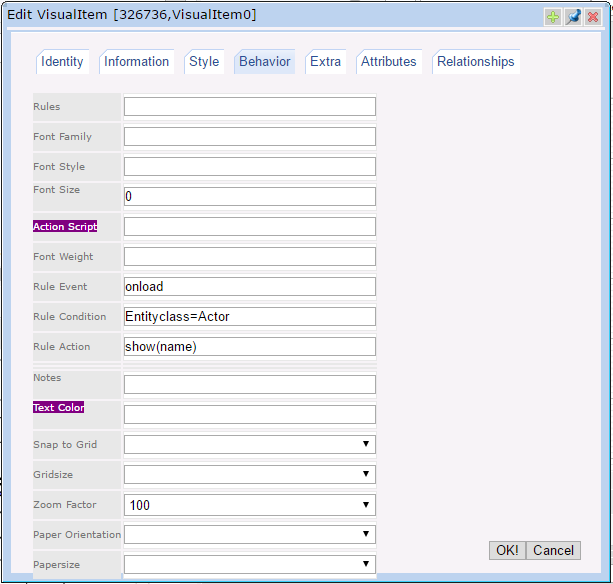 Now you have a view (a filter) of a model showing only the actor items of the model. Now we are going to create Visual Items (little visualization fragments). A Visual Item is a data/shape placeholder connected to a view, and it is put on a visualization canvas. You can put as many visual items on a canvas as you like. With Visual Items you show shapes on a canvas for the data in a view. In the next steps we are adding a Visual Item on the canvas and configuring it to generate some shapes for the data in a view. This rule you have configured means: get all the Actor entity classes from the data of linked view and show them with Stakeholders shapes plus their names, on the linked visualization. On the Help System is a page with extensive documentation and examples of how to configure rules. 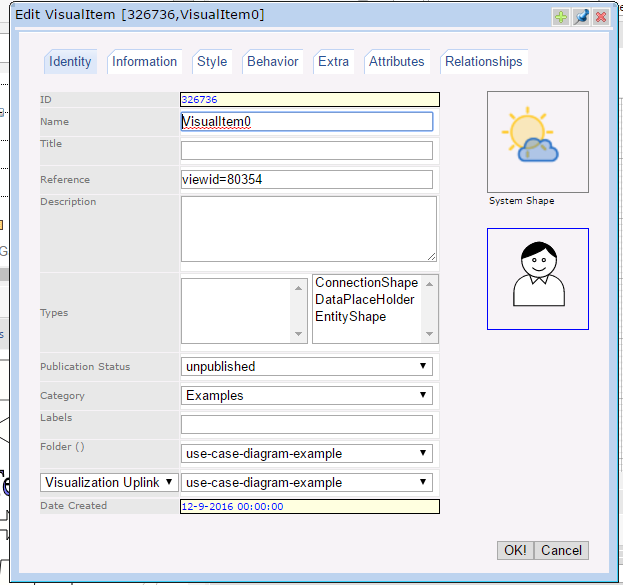 You will see Stakeholder shapes with the names of the Actors next to a system box on your visualization. If you want also to have the use cases shown in your diagram, add a second Visual Item and repeat the steps above or change the rule of the first View and Visual Item into 'Entityclass=*', so it will show the whole model. 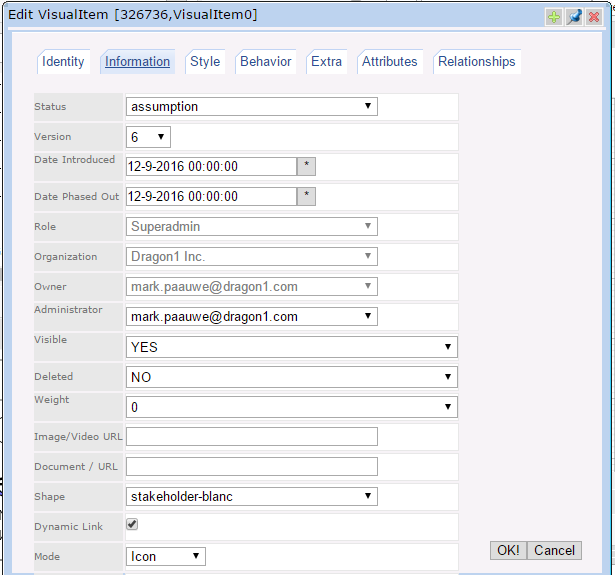 You have created a DYNAMIC basic Use Case Diagram on Dragon1. Now you can, for instance, vary with the rule attributes and see how the diagram changes. 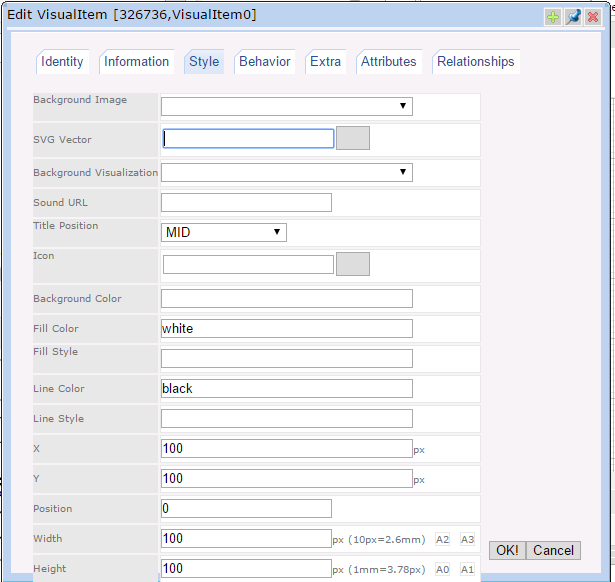 Change the data and see how the diagram is automatically updated. Change the name of a data item and go to the Presentation Mode and select your model, view and visualization to see the changes made.